This Scalar essay engages the material and online archives of Korean American conceptual and intermedia artist, Theresa Hak Kyung Cha, which are housed by the Berkeley Art Museum and hosted by the Online Archive of California. This preliminary exploration foregrounds the current complexity of archiving practices and the challenges that must be contended with as archives take new digital forms and produce new representations. Authoring in Scalar has enabled me to create live links and quotations to Cha's online archive directly within my text, and has allowed me a preliminary mapping of future trajectories that I will soon undertake with greater depth. Scalar media has productively highlighted the distinctiveness of analogue and digital archives with navigation that is accessible, but also inaccessible, and halted. My interest in particular in the archival film elements and ephemeral fragments that constitute Cha's unfinished 16mm film, White Dust from Mongolia, brings attention to the particularities of archival materials and forms, as White Dust remains an unfinished constellation of notes, storyboards, film fragments and aspirations that are in suspension. Intermediality operates at the heart of Cha's practice. Materiality of language as text, as spoken word, as sound; materiality of film as projected light; video's luminescent image. All are insistently drawn attention to throughout her rich oeuvre. As an artist deeply invested in intersected explorations of diasporic identities, languages, translation and poetics, their representations and power, and as an artist who moved with ease, curiosity and playfulness across different media, one can easily conjecture on Cha's own ruminations on this provocative problematic: What are the relations between the Berkeley Art Museum's material archive, and the Online Archive of California’s Cha Collection in consideration of (her) intermedia-based practice? What is lost and wanes, and what is enhanced? What is the primacy of the material artifact and the specificity of the digital when it is reproduced for, and leads a double life in the online archive? How does this challenge us to devise creative forms and practices for animating archives in new ways? And how can this contribute to contemporary scholarship on and practices of media archiving and digital preservation in relation to conceptual art practices, intermedia and digital environments? 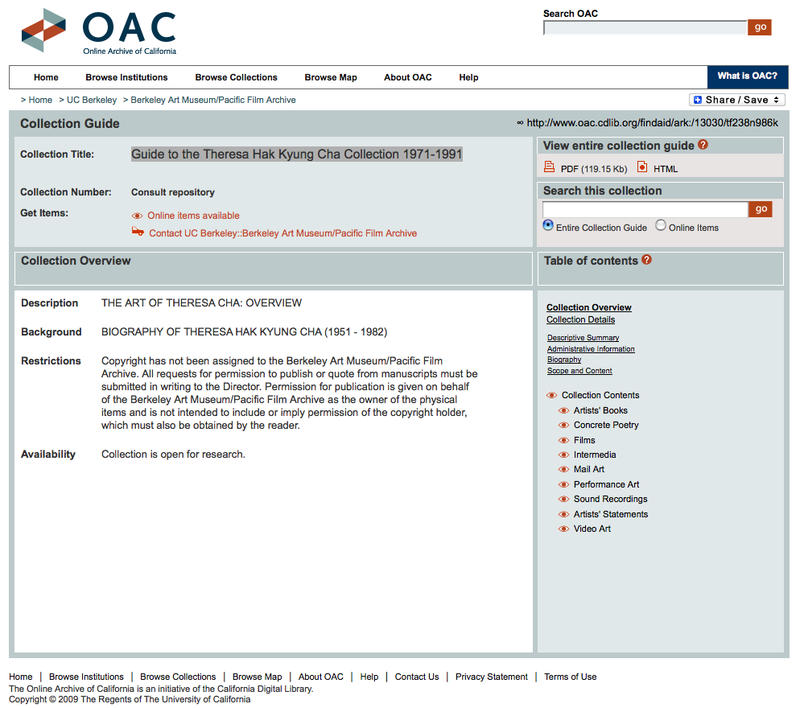 Discussion of "Communicating the Intermedia Archive: The Theresa Hak Kyung Cha Collection"
Version 120 id 30230 of this page, updated 08 January 2013 by Monika Kin Gagnon. Created by Monika Kin Gagnon.